During my days at Our Price, I had a friend and work-colleague who, upon hearing a particular bass-playing style would impart the immortal phrase, "'Ark at that bass" (in broad Plymouthian). Flea was his idol for a while but prior to metal's slap-basshead appearing on the scene, later to be replaced by the late Mick Karn of Japan, the very different Steve Harris of Iron Maiden would provide much source of enjoyment for the lad. And you can hear why - Harris certainly has a unique style which has given Maiden that galloping impetus, drive and power that a few bassists in other outfits have attempted to do for many decades since. But, they just don't come close to the enigmatic East Londoner who has been Iron Maiden's only continual member since the band's inception. So it all came as a bit of shock when Steve Harris announced his intentions to branch out a bit - could it be the end of Iron Maiden as we know them? Nah - Steve's got some of his own tunes and wants to play them with some other mates. That is all. And thus, British Lion was born. Or rather, 'unleashed'. 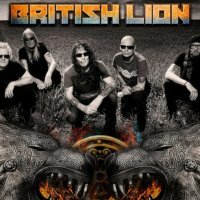 With a classic, reliable and robust logo of a wild-cat's head inscribed with Celtic ephemera, you knew what you were going to get with an album and band called British Lion. Classic, reliable and robust heavy-rock. And that's the premise for the very first British Lion tour - his gigging band-mates will include those found on the album of the same name and all shows will be in non-arena club venues. First stop is Islington's Academy on 26th March, followed by Birmingham, Glasgow and Manchester on the 30th. Prices start at a very reasonable £16, rising to £17.50 for London. Tickets on sale now. Those generous price-rates should ensure a mad dash for tickets - get in!